I created a Peacock Costume for Halloween one year. Not only was it beautiful, but it won me first place a $1,000 cash prize for the Halloween Costume Contest in Chicago. The design isn’t very difficult if you know what you are doing. I would not suggest it as a do it yourself project for a beginner. Check out the photos for some images from the night! I just finished making it a few hours before hand, this is me at a professional shoot in the costume post Halloween. I do hair and makeup as well so I wanted to go extreme with the eyes and used a lot of complimentary colors (blue and green). I mimicked the shape of a peacock feather for the design around my eyes. It’s Halloween, go big or go home! Don’t be afraid to lay the makeup on heavy, it’s one night you can get away with it! Have fun! For the hair I used a foam ball and placed fake hair in my same color around it then fastened it to my own hair. Sprinkling some leftover peacock feathers throughout gave it a more cohesive design. Here is the notification from the 1st prize win at the Chicago Haunted Hotel Halloween costume contest that took place at the W Chicago City Center in 2009. I ended up getting into the studio with the piece shortly after Halloween. I went a different route for the skirt and hair. Photographer Michael Rosen did the costume photos, I absolutely love his lighting. You’ll notice the hair is more centered. I think having ‘high’ hair for the costume gives it more of a birdlike feel. 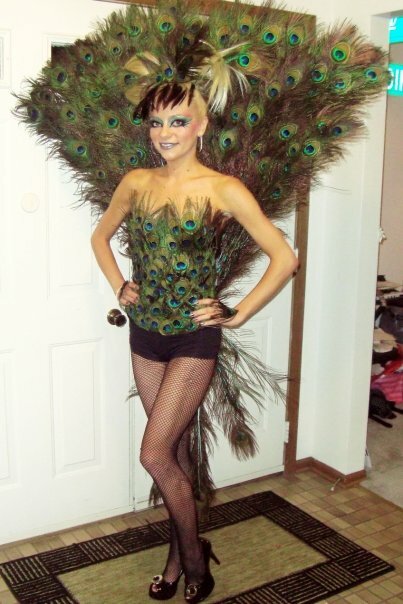 DIY Peacock Costume Instructions: To make the costume I ordered 250 x 3′ tall peacock feathers online, bought two mending plates (from HomeDepot), bought a plain black corset, food coloring, sewing materials, and a hot glue gun. I dyed the stems blue and teal by boiling water – adding the feathers to the water (stems and all in a huge metal tall pot) and then adding the food color. By the time the water cooled the organic material in the stems absorbed the color. After I did this for all the stems I placed them in an arc shape and hot glued them together. Keep it neat as you don’t want hot glue to show through your costume. I then took just the eyelets of the feathers and lightly glued them in place to covered the front and back of the fan. I bent the mending plates in half and glued them in place, making sure to cover the holes all the way around with glue. I placed it a little lower than where I would want my shoulders to hit as the open end (U shape facing down) goes into the back of the corset. I sewed on a few of the feathers to the corset, put all the pieces on – did some cool hair/makeup – and I was done! For the feather skirt in the top photo, I used feather trim found at the craft store. I am a Halloween costume designer, wearable artist, wardrobe / set / prop designer based in San Francisco. If you are interested in using my services, contact me today for a quote!